Recover Lost/Deleted iPhone Text Messages. Save, View, and Print iPhone Text Messages. Step 3: Run Decipher TextMessage. Select your iPhone and press the Recover button to look for lost iPhone messages. You may also find this guide on recovering iPhone text messages helpful! When you erase a text message on an iPhone, it is simply marked as "deleted", to be overwritten with new messages later. 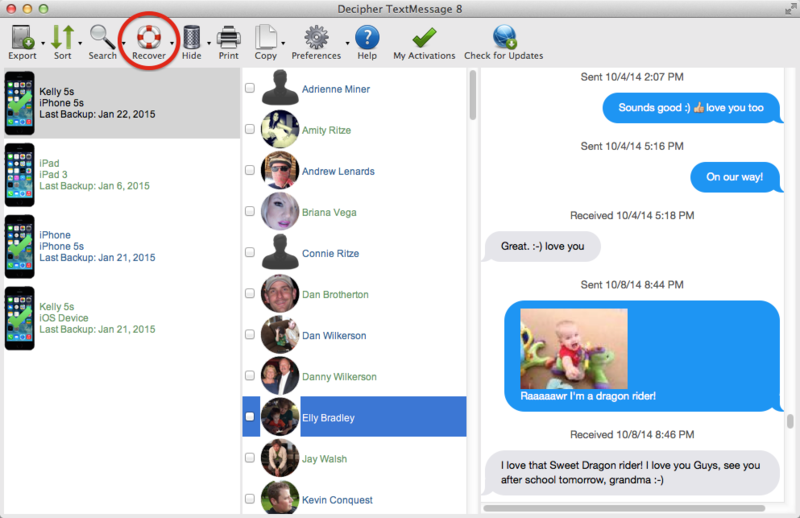 Decipher TextMessage finds those deleted messages and shows them to you in a simple, searchable interface. Run Decipher TextMessage and click the "Recover" button in the upper left corner of the window. 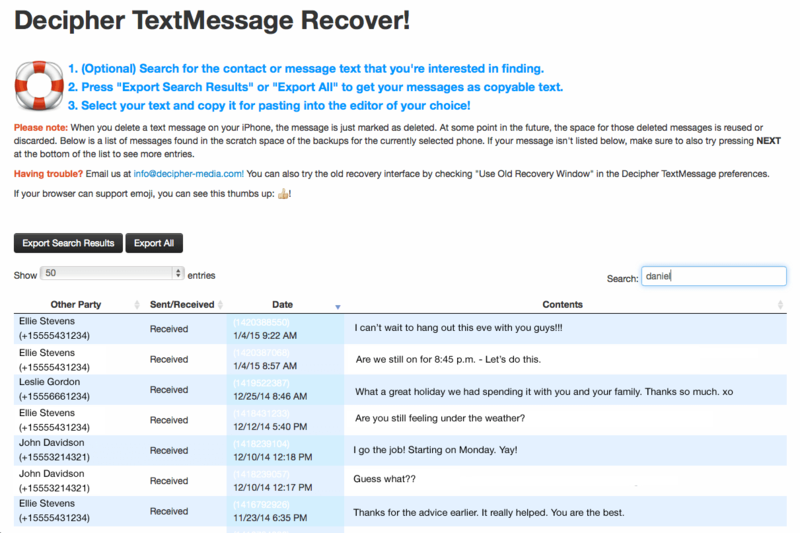 Search and sort through your recovered messages. Recovers SMS, MMS, and iMessage text messages. Compatible with backups from iPhone, iPad, and iPod Touch. Uses iOS backups, for your privacy and the best recovery experience. Aggressive recovery mode shows you more erased data. Deleted text message data is searchable and sortable. We offer a 30-day moneyback guarantee, in the event that your messages are not recoverable. "I got my phone in October and had never deleted any text messages I ever got from my boyfriend. One day I wasn't paying attention and accidentally deleted all 2,000+ messages. Decipher was able to get back every single message from message 1 up until the last time I synced my phone. I was overjoyed." "Awesome tool! Works like a champ as advertised and at a great price compared to the wankers wanting to charge $100 for this kind of stuff." 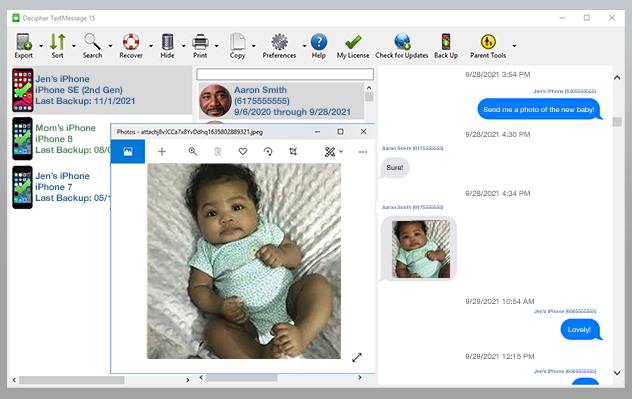 Decipher TextMessage is Mac and Windows software to recover deleted text messages in the Messages app, including iMessages, group chats, and MMS messages. Decipher TextMessage works with backups from iPhones, iPads, and iPod Touches. All of your text message data remains private, since all of the deleted text message recovery work is performed locally on your computer. We love building on Decipher TextMessage and helping our customers get the data they need. If you have any questions or problems with Decipher TextMessage please feel free to contact us. Before contacting us via the support email, we ask that you read our FAQ since many helpful answers are available there.